Restrepo gets an Academy award nomination. Let’s hope that the link to the Restrepo trailer posted back in the summer helped generate interest in, and awareness of, the film. As soon as I heard the news (thanks to 1854 tweets from BJP), I sent Tim an email to congratulate them. He replied: “Thanks Miranda. We’re completely thrilled. We made Restrepo with equipment we could carry on our backs in the mountains of Afghanistan, and it never crossed our minds that we might receive an Academy nomination for our work. “We are beyond thrilled, but we feel that this recognition mostly speaks to the courage and dedication of the men of Battle Company who fought and died in the Korengal Valley. Today’s post covers some varied ground from an invitation to view a trailer of award-winning photographer Tim Hetherington and Sebastian Junger’s feature-length documentary film Restrepo to calls for entries for the Athens Photo Festival 2010, a Web Documentary Award and an artist’s residency in the UK. 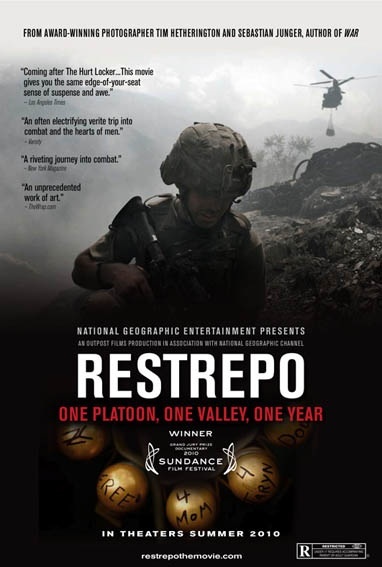 “Winner of the 2010 Sundance Film Festival Grand Jury Prize for a Documentary, RESTREPO chronicles the deployment of a U.S. platoon of courageous American soldiers in Afghanistan’s Korengal Valley, considered to be one of the most dangerous postings in the U.S. military. “From May 2007 to July 2008, Tim Hetherington and Sebastian Junger dug in with the men of the Second Platoon, Battle Company of the 503rd Infantry Regiment (airborne), stationed at Restrepo, sharing duties and and shooting more than 150 hours of combat, frustration, routine, jokes, terror and bravery during daily life at the outpost. The film goes on general release in US theatres from 25 June with release dates in the UK and Europe to follow. You can support the movie at this critical time by helping to reach as many people as possible. Just view the trailer Restrepo and let other people know. You can also sign up to support the film at their Restrepo facebook page. Changing Ideas is a charity that “champions the belief that great photographs and visual storytelling can really make a difference to the work of charities and NGO’s. It promotes the use of photography in humanitarian campaigns and as a catalyst for change”. To this end, it is offering a new residency for photographers, photojournalists and multimedia artists at the Old Church House located in the fishing village of Pittenweem, Fife, Scotland. Residents have full use of the space, which was renovated in 2009 and includes facilities for the disabled. Resident artists will be given the opportunity to finish existing projects, develop new work and ideas or create work that has a meaningful and humanitarian aspect to them. The charity is”also keen to support collaborations between photographers and journalists that seek to develop new and innovative combinations of image and text”. The residency is offered free of charge, with artists receiving a daily allowance for food, personal expenses etc. Projects may be considered for grants if they are humanitarian in nature and fulfil the aims of Changing Ideas. Changing Ideas and Old Church House are initiatives of photographer David Graham.